Concordia University Chicago has officially signed with Barnes & Noble College to operate its campus bookstore. Barnes & Noble will begin management on June 12 and will offer students more than the typical bookstore experience. 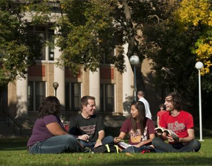 Founded in 1854, Concordia University Chicago is a private, four-year, Lutheran liberal arts university, located in the Illinois suburb of River Forest, ten miles west of Chicago. With an enrollment of approximately 5,000 students, Concordia prides itself on having small class sizes, giving every student a personalized experience and ideal opportunity. The university is comprised of the College of Arts and Sciences, the College of Business, the College of Education and the College of Graduate and Innovative Programs, providing the tools necessary to achieve undergraduate and graduate degrees, as well as doctoral degrees. Concordia University Chicago is one of 18 higher educational institutions that Barnes & Nobles College operates in the state of Illinois including The University of Chicago, DePaul University, and Illinois Institute of Technology.